FTIR and DI are the two main technologies used in NUIGroup (Information on alternative techniques will be posted at a later time). Specific Parts (brands, types, etc.) and techniques for completion can be found on the rest of the forum. Infrared light is shined into the side of an acrylic panel (most often by shinning IR LEDs on the sides of the acrylic). The light is trapped inside the acrylic by internal reflection. When a finger touches the acrylic surface this light is “frustrated” causing the light to scatter downwards where it is picked up by an infrared camera. A silicone rubber layer is often used as a “compliant surface” to help improve dragging and sensitivity of the device. When touching bare acrylic, one must press hard or have oily fingers in order to set off the FTIR effect. With a complaint surface (like silicone rubber) the sensitivity is greatly improved. Diffused Illumination comes in two main forms. Front Diffused Illumination and Rear Diffused Illumination. Both techniques use the same basic principles. o Diffuser/Projection Surface (Vellum, Mylar, Lee Filter, other, etc.) *Note: The Diffuser/Projection Surface must let some light through. DSI uses a special acylic to distribute the IR evenly across the surface. Basically use your standard FTIR setup with an LED Frame (no compliant silicone surface needed), and just switch to a special acrylic. This acrylic uses small particles that are inside the material, acting like thousands of small mirrors. When you shine IR light into the edges of this material, the light gets redirected and spread to the surface of the acrylic. The effect is similar to DI, but with even illumination, no hotspots, and same setup process as FTIR. A frequent question is “What is the best technique?” Unfortunately, there is no simple answer. Each technique has it’s pro and cons. The answer is less about what is best and more about what is best for you (which only you can answer). The General consensus is: If you need object, fiducial, and hovering recognition than rear DI is most likely for you. If you only need a robust and reliable finger recognition, than FTIR is a great choice. Front DI, although the simplest to build, is rarely used as a permanent setup since it heavily relies on the surrounding environment. o Not truly pressure sensitive (since light intensity doesn’t change with pressure). 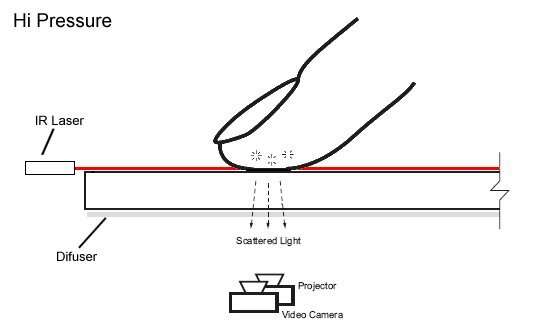 o Can cause occlusion if only using 1 or 2 lasers where light hitting one finger blocks another finger from receiving light. Enclosed box is not required. Shouldn’t it be: Enclosed box is required ? Thanks zuppaman. Good eye. If anyone finds any other errors, let me know. From the difference in contrast on FTIR and DI, I assume that tracking sliding gestures is easier with FTIR. Right? I don’t know, my webcam is picking up my fingertip blobs as bright as an IR LED pen. I am using Rear DI at the moment just using 2 desklamps to illuminate the surface evenly. Not good but it works for now! @ Calvin Muller: If you look at the two images above, you’ll see what I mean by contrast. FTIR will almost have a completely black vs completely white contrast in the raw image. Rear DI on the other hand will never have the black part (although it may in rare occasions have the same white brightness), but therefore less contrast. i understand what you were saying cerupcat, but with the awesome touchlib library.. the blobs are as bright as anything using DI i was just stating my situation and not criticizing anything you said above. Excellent post cerupcat. Maybe augment with links to other forum posts on how to build each type of display? This way this thread can become a 1 stop shop. So, this sounds like it could be a very stupid question, but how does the image show up on the surface without it getting in the way of the camera, and is it easier to use projection or lcd? I’ve updated the main post to add LLP and DSI techniques. Vlado, i’ll probably add the LCD laser when I have more time. The LCD isn’t really technique in itself. It’s still FTIR.